Since moving to Whangarei I have been amazed at the productivity of the estuarine and harbour areas Northland has to offer. Over the last few months I have explored many of the tidal mud flats on both the east and west coasts and have seen an abundance of flounder and mullet - as well as dozens of legal sized snapper - while checking likely flounder spots out during the day or spotlighting for flounder at night. The second video below shows spearing the flounder. 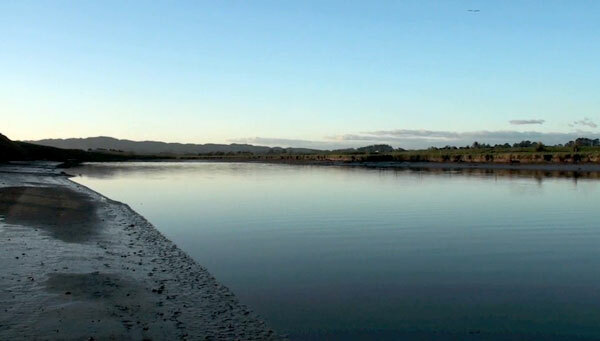 Above: A typical New Zealand estuary with a huge variety of bottom types along it's length. Always check the area out during daylight at low tide a few days before you before going spearing flounder at night. This allows you to identify areas of soft mud, creeks, channels and banks and identify productive stretches of preferred flounder habitat. While it is difficult to spot flounder during the day any you startle will leave a tell tale trail of disturbed water. I hadn't been floundering for thirty years, so had long forgotten what a tranquil and productive pastime wading the shallows for flatfish at night is. Contrary to what I had always believed, flounder are to be found in very shallow water year round. Surprisingly, while walking along an estuary bank on a cool August evening I spotted over a hundred flounder before the sun had set. I have seen flounder over every bottom type since then - including two soaking up the remaining warmth of the day basking on a boat ramp after the sun had set! While most abundant over softer mud I have spotted many big yellow belly flounder on gravel, between large rocks, in half buried tree stumps, basking on flat papa rock, over clean sand and shell banks. Some have been in water so shallow their backs have risen out of the water! 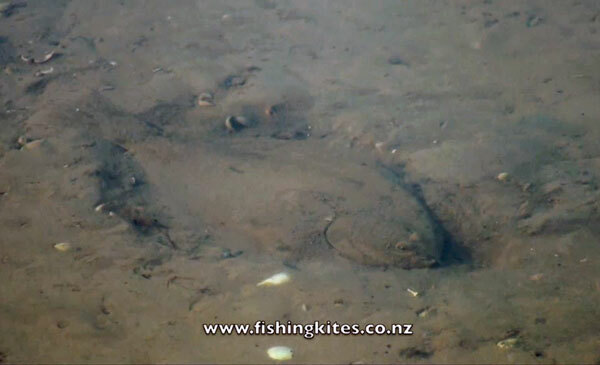 Anywhere a creek or stream enters the estuary usually holds one or two good sized flatfish and I always check these these areas out very quietly and thoroughly. Since making the video I have found another great floundering spot, a cliff overhangs a channel and just yesterday I had the good fortune to be able to observe four big flounder feeding on the edge of the channel for 20 minutes. When flounder are completely unaware of your presence it's surprising how active they are in chasing their prey. I will take the camera next time and see if I can capture it on film. A school of large mullet was in the area and the flounder didn't even flinch as the mullet jumped all around them, often splashing down less than a metre away. Yet we considered ourselves really lucky if we could sneak up to within five metres of one. I think it would be extremely difficult to spear anywhere near a bag limit during daylight hours. The photo above shows one of our new flounder lights in action. The beam from the three torch unit clearly illuminates the bottom 15 to 20 feet away. 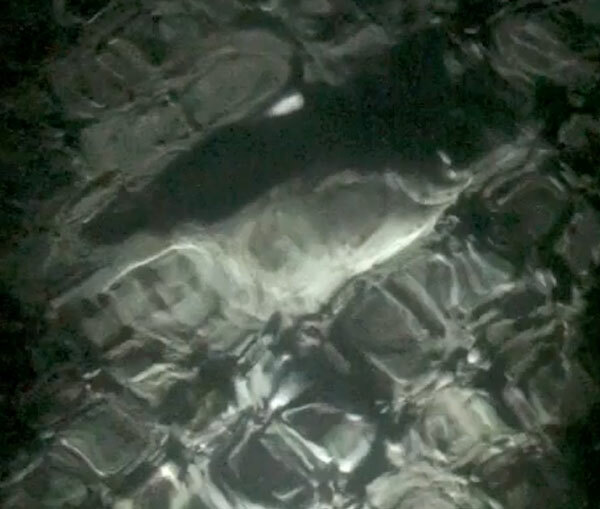 Flounder are fickle and skittish by day but absolutely confident of their perceived invisibility at night, the one below stayed perfectly still for more than two minutes as we filmed it. My feet were inches away from the fish, as we withdrew the flounder light the fish slowly moved away. Above: A big yellowbelly caught in the glare of the new 9 watt 600 lumen flounder light. This was one lucky flounder as I had both the light and camera to operate I was not carrying a spear. 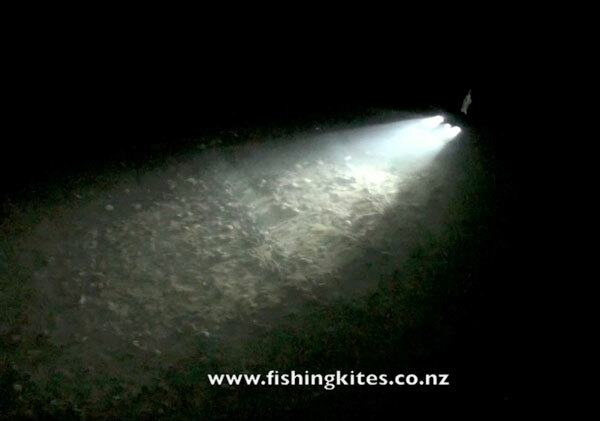 The most important thing is a good flounder gigging light, check out our Flounder Lights here. Tight fitting hard soled diving booties. These are best for all bottom types especially soft mud as they won't pull off with suction and they are warm. The bigger and harder the soles the better. A flounder gig or spear. Single prong spears without barbs are perfect for New Zealand flatfish species when wading, simply slide your hand under the speared fish before lifting out if the water. Multi prong flounder gigs are essential for spearing flatfish from boats and larger American flounder species. The gig points must be barbed or turned in to prevent the fish falling off as it is lifted from the water.